Paddy Power, known for innovation when it comes their controversial ads and publicity stunts, have used their creativity and ingenuity to develop highly popular mobile sports betting apps and sites for iPhone, Android, Blackberry and Nokia devices. 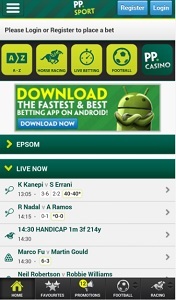 The Paddy Power Mobile App features to live horse race streaming from UK, Irish, South American, South African and Dubai racetracks, and will give you access to Paddy Power’s famous Money Back offers. Also be sure to check out Paddy Power’s Top Ten Bets section to get an idea of the most popular bets at any given time.